Making sure employees are trained according to their functions and retrained when necessary, is no easy task. Failing to do so, however, can be disastrous for the company from a regulation compliance perspective. QualityKick’s Trainings module automates the process of training assignment, training completion and retraining, ensuring all employees are properly trained for their specific tasks at all times. Define employee tasks or “functions"
Which functions are there in your company? In QualityKick you start by creating as many “user functions” as you like. A user function is a specific task for which an employee must be trained before she can perform that task. Each user function can then be assigned to one or more trainings, which effectively assigns the relevant users to their trainings. Available documents from the Document Control module can easily be assigned to the training. Links to other systems like an intranet or files on file storage somewhere in your company network. While configuring a training, you must select for which “user functions” the training is applicable. This way QualityKick will know automatically which users to notify asking them to do their training. 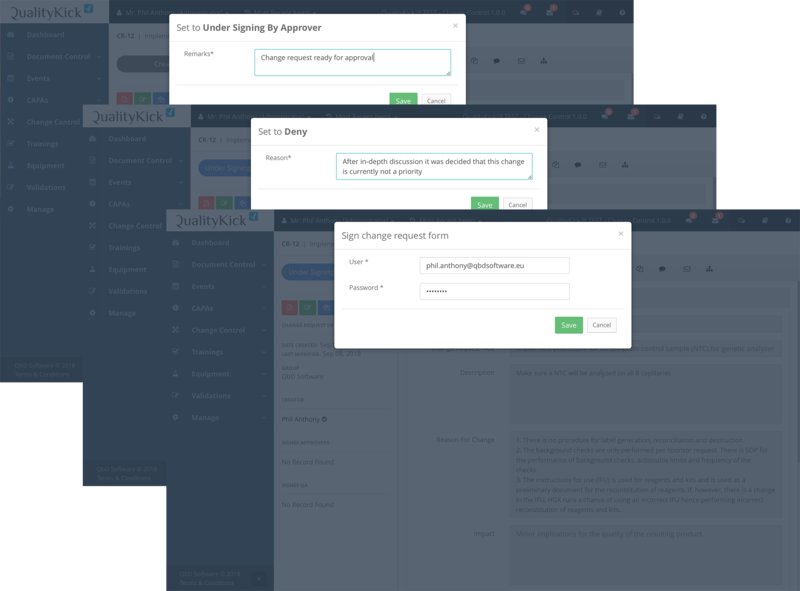 When a document gets a new version, QualityKick will again notify the relevant users automatically to inform them about the required retraining. On the Training Detail page, the user can see exactly which training materials need to be marked as Read&Understood and which tasks need to be signed off. A progress bar indicates clearly how far they are in the training. Even though QualityKick cannot really know if the user has read the material and if the user actually understands it, it does check if the reading material was at least viewed once. Supervisors can easily see the percentage of users who finished the available trainings. This gives a birds-eye view of the status of trainings overall. Additionally, on the training detail page, supervisors can see exactly the training progress of each of the assigned users. Forget about manually notifying people about retraining when a training is modified or when a document gets a new version. QualityKick knows exactly when this happens and who needs to be notified to make sure everybody remains properly trained. QualityKick’s Trainings module provides you with the peace of mind you need, by automating the training workflow and providing real-time insights on the status of trained staff in your company. Assign documents, external links and configure training tasks through a user-friendly user interface. Configure and forget. Let QualityKick take care of assigning trainings to the right users and notifying them about their training and retraining requirements. Get the insights you need regarding training status on company level, training level and user level. Easily download training reports or export training data in CSV format to use in other systems. I came in touch with several of the QualityKick modules while helping an NGO build their identity. Both the client and I were pleasantly surprised with the ease of use of the system. The training module in particular simplified designing and tracking employee training in alignment with identity-building objectives. It established a more autonomous workforce and freed up the organization’s leaders to focus on the big picture. The Trainings module gives us everything we need to have our staff trained according to compliance regulations. Things are really easy to configure and trainees love it as well. The best part of the Trainings module is the automation part. Notifying employees about their required trainings and retrainings was a big time drain in our company and this part is now solved completely by QualityKick. Below you can find a list of the most frequently asked questions regarding the Trainings module. But if you still have doubts, please let us know! Do I always need to assign a user to a training through a “user function”? No,you can also assign a specific user to a training as an exception. However, user functions are meant to automatically assign users to trainings according to their functions and tasks in the company. This is recommended to keep training assignment organised and automated, but there can indeed always be an exception. Can everybody create or edit trainings? No, only Training Supervisors can create and edit trainings. 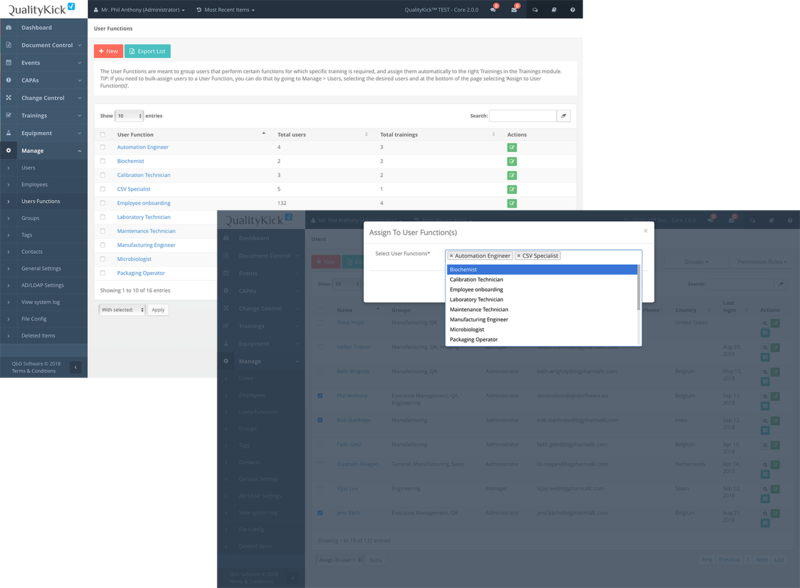 Any user (except for read-only users) can be configured as Training Supervisor to enable them to manage trainings. Can read-only users be assigned to trainings? Do all employees need to have a user account in QualityKick to manage their trainings? 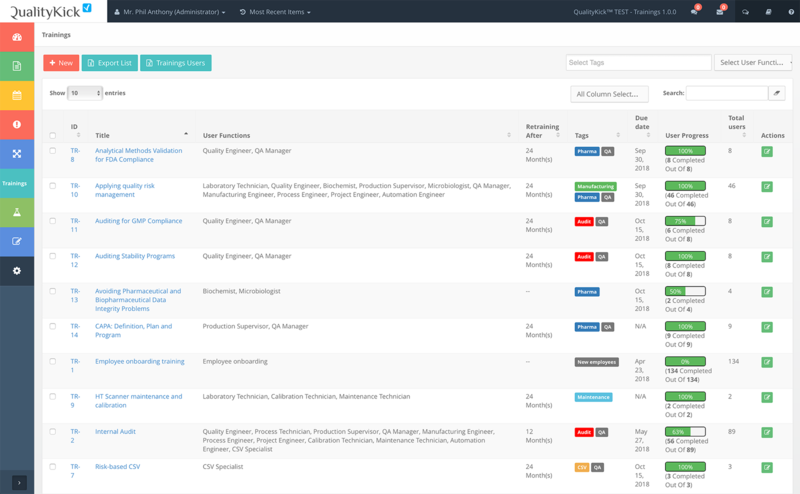 It would be best to provide all employees who need training with a user in QualityKick (they can be a read-only user) to automate the training workflow as much as possible. 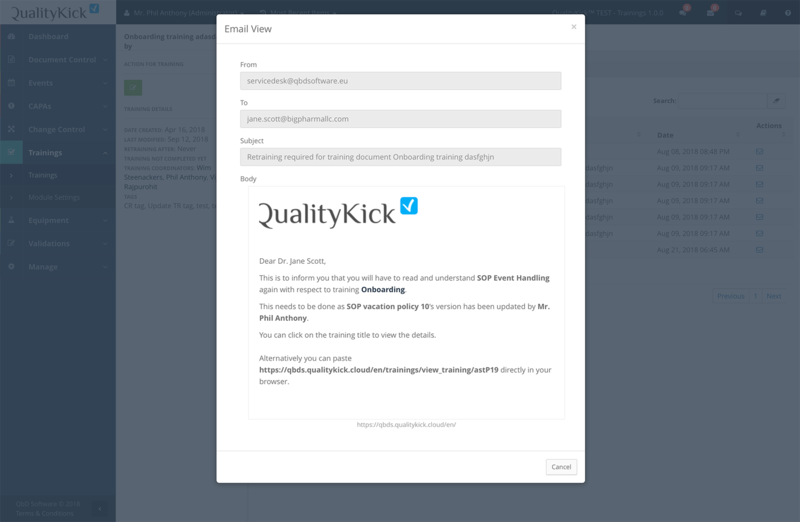 However, in case certain employees normally don’t have access to a computer and do not even have a company email address, you can use the “Employees” feature in QualityKick. This enables training supervisors to import a list of employees with their names and some unique ID after which training supervisors can set them to “Trained” manually. 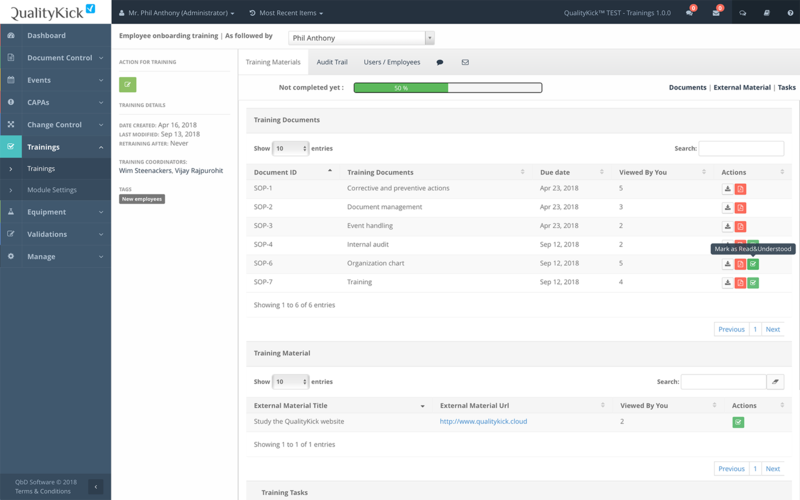 This way you can still have a clear overview of the training status of all your employees, not only for the ones who actually have a QualityKick user account. Can I create tests or exams which need to be completed in QualityKick’s Trainings module itself? No, we are currently not providing functionality for this. As a workaround, you can create a task in the training which consists of doing a test in some other system or on paper and let the user sign off on that task while uploading proof. I would like retraining to be triggered before a document is actually published. Is this possible? Yes, this is default behaviour in QualityKick. Before a document in Document Control gets published it receives the “Approved, not published” status. This status already triggers training or retraining (for a new version of an existing document). During this status users are notified by email to inform them about finishing this training.